Next we headed to 阴阳海 (Yin Yang Sea) this sea is interesting because if you look closely you will see that the sea is actually two colors Blue and Green. The reason is if you look directly behind you, you will see a large abandoned building that use to be a mining company and long ago apparently residue from the minerals use to leak into the sea. Since the sea can not dissolve the minerals, it leaves the discoloration of the sea (unfortunately we were not high enough to get a good picture). 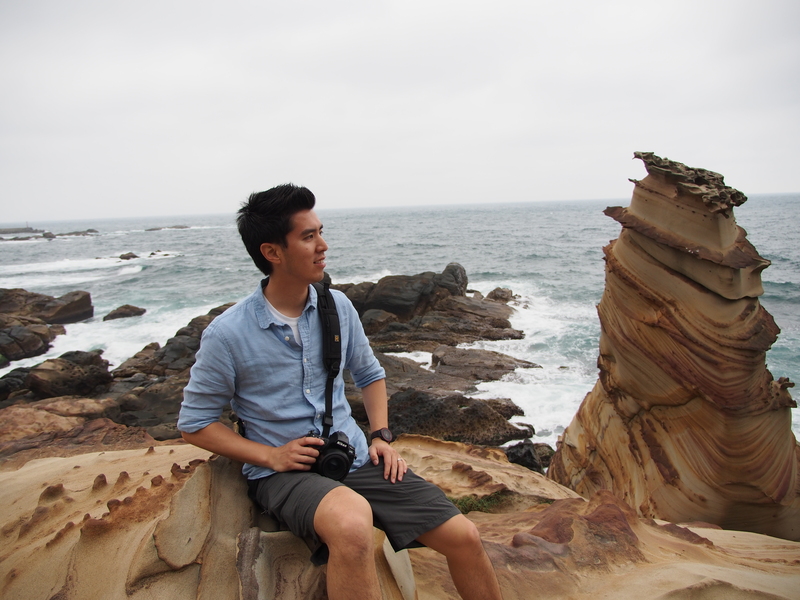 Further down highway 2, we stopped by 南雅奇岩 (Nanya Rock Formation), just off the road this is a scenic stopping point. A cool area to wander around, check out the unique rock formations and take time to enjoy the waves crashing against the rocks. 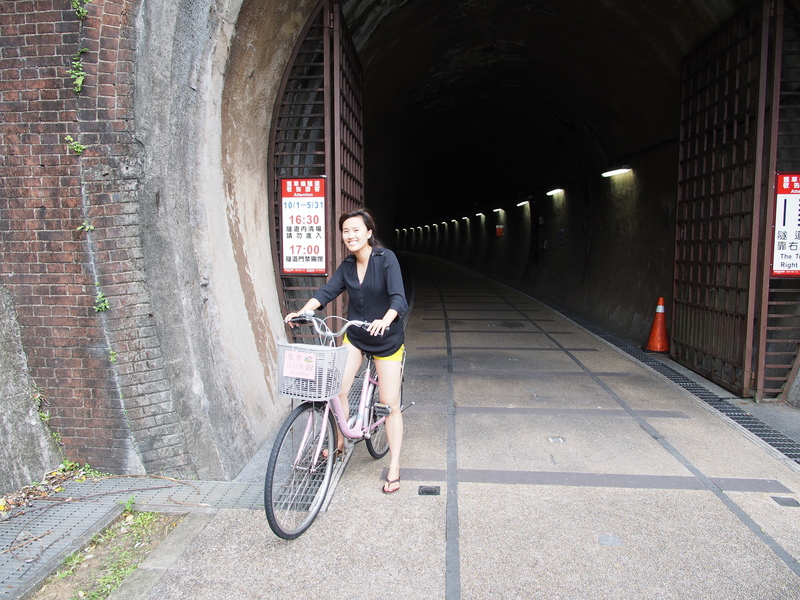 After seeing the coast we headed to 草嶺隧道 (Caoling Railway Tunnel ), located in 福龍(Fulong). 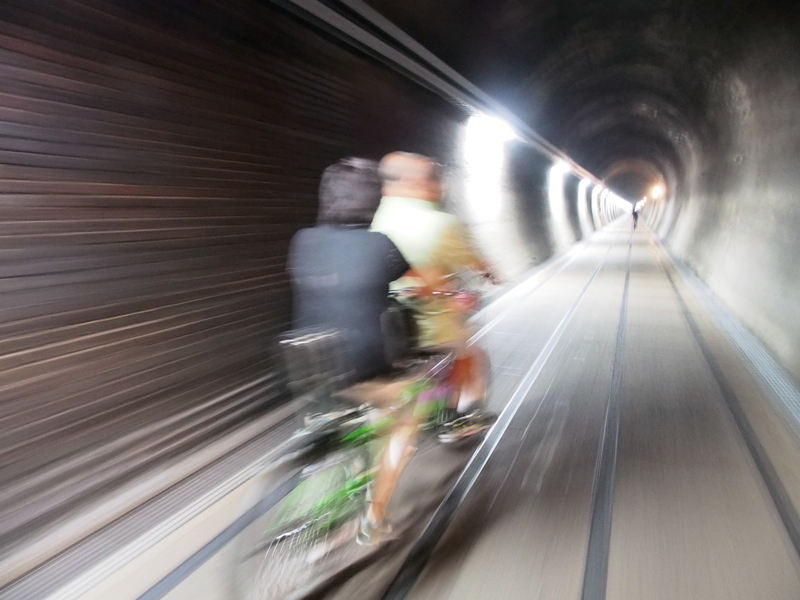 The tunnel was used as a railway link between two cities bout 20 years ago, now it has been refurbished and transformed into a bike path. 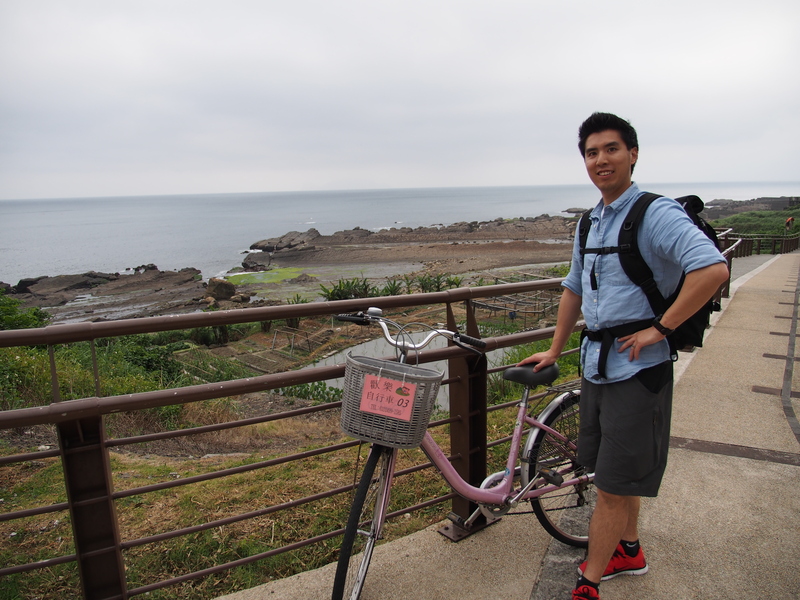 We were able to rent bikes for about $100NT for 3 hours. The tunnel is about 2-3km long, but its pretty cool riding inside the tunnel as it gives you the illusion that you are riding on train tracks, its dark and I think it also has train sounds playing. Once you arrive at the end of the tunnel you emerge to a small rest area where there are beautiful views of the ocean. If you have extra time, I suggest spending a few hours biking around as there are longer paths you can take. Since we worked up quite an appetite, we stooped by a local seafood restaurant and had fresh seafood dinner. 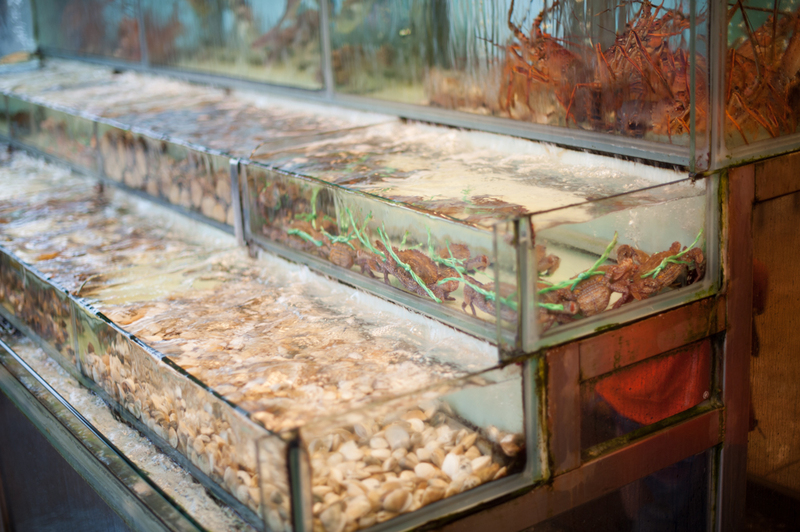 You go out to the tanks and pick what you want, then they cook it for you and bring it to your table.. .YUM! We headed home since it was about 5pm, of course no day would be complete without a trip to the Night markets! We went to our local night market and ate some delicious food. 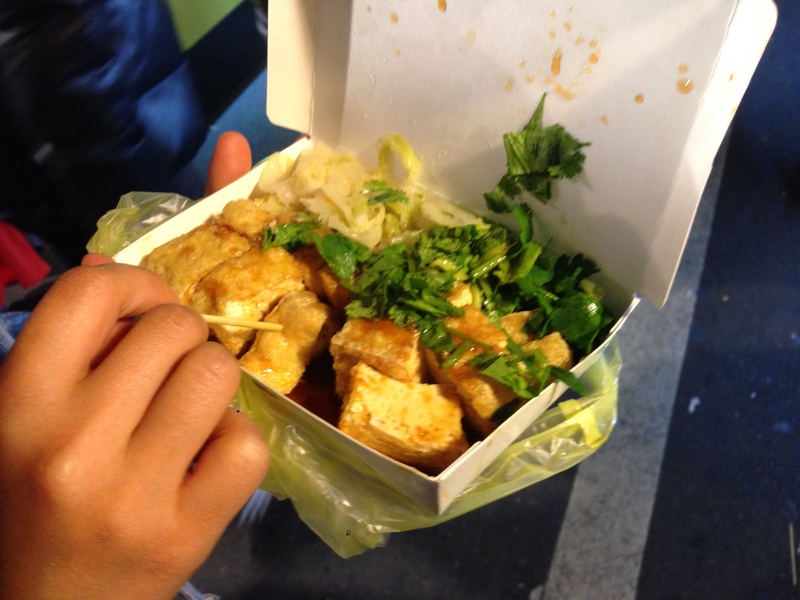 I was finally able to get my favorite dish…stinky tofu!